This truck delivers both power and cargo capacity. It's built on the durable E450 Super Duty chassis and carries an 18' length body. It has a powerful V10 gas engine, 14,500 GVW and a 2000lb aluminum railgate. 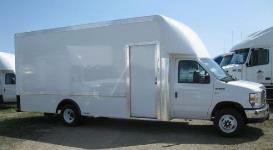 Call us @ 1-800-200-0404 about this truck or click below for a free online quote. We offer flexible lease-to-own options and would welcome the opportunity to support the success of your business ! (2) rows of recessed E-track each side located @ 38" and 57"
Click below or call us @ 1-800-200-0404 to get more information and a free no-obligation quote on this great truck ! Whether you know exactly what you want, or need to find the perfect truck, search our inventory of trucks!